2573 W. Valley View Dr. Thank you for visiting Abilities United Productions. I hope your experience has given you the impression that I do hear from so many who take the time to write or call. 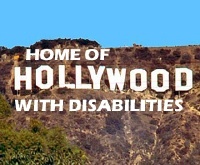 It is of real excitment, energy, honest hope, and positive change in the entertainment industry - giving that dream of self representation, expression, and the same fair and equal opportunity that Hollywood gives all other minority groups, consumer market segments, and voices of those who are under-represented - except for those with a disAbility that can represent themselves. All of us who feel that everyone should have the same human and civil rights to represent and portray ourselves in the entertainment industry understand that it is a very up hill challenge and have a long way to go - but the foundation, the business model that will prove how to successfully incorporate the fair and equal opportunities to those with a disAbility through authentic voices, visions, performances is clearly defined and set within Abilities United Productions. Soon as I get the opportunity that I am tiredlessly working toward - because no one is going to give it to you - into theatres and not only with my first feature, "London Time" through which I completely anticipate success of creating a lot of buzz, but also through a slate of films I can quickly follow up on the success of "London Time" - the industry will see through all the support at the box office and in our strength of home entertainment consumers - that the authetnic representation and non-stereotyped characters and stories - when produced and presented in a specific framework - detailed in my business model - will be very successful - not only within the disAbled community but universally appealing with general audiences domestically and world-wide. Join with me and keep the hope alive, the impossible dream a reality, not only for ourselves but for future generations who will finally and forever have the same opportunity that all other minority sub-groups in our society have to dream of becoming a Hollywood star based on their talent, desire, hard work, sacrifice, and yes Ability - regardless of how different they may look, their personal challenges, limitations or disAbility!